In my previous post about TDD and Erlang I listed some ways to improve both coding proficiency and Erlang knowledge. This week I would like to write here my opinion about the series of videos gently provided to me by O’Reilly: “Erlang by Example with Cesarini and Thompson”. I guess that many of you (especially the non Erlangers ones) are now wondering: “What are the topics in detail? Who is the target audience? Should I buy the videos instead of a normal book? Are these videos really so good?” Well, let me answer that in the rest of this post. What are the topics in details? – As you may notice from the list above the video lectures starts with the basics (data types, variables, pattern matching, etc etc.). After that you will learn things mostly related to sequential programming and concurrency. A good point of these videos is that you will end up with something real: a simple client-server application handling mobile frequencies. 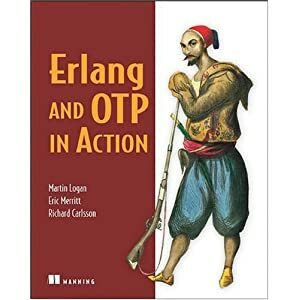 Notice that in the list above there is no reference to OTP: in fact you won’t learn about OTP here, but I believe many Erlangers are right when they say: “Learn with ‘normal’ Erlang and code your application using OTP”. Who is the target audience? – Good question. Are you new to Erlang development? If so buy these videos. You will learn much and in a fast way. On the other hand I think that many experienced Erlang developer should take a look at these lessons, not only to review the basic concepts but also to hear the considerations and the suggestions of two of the most respected Erlangers out there. Sure, if you know Erlang very well you will skip some stuff, but still you will enjoy the lectures in their whole. Should I buy the videos instead of a normal book? – No. Don’t do it! I have to be clear here: you won’t learn Erlang just by watching these videos. I believe these videos must be considered as a wonderful integration of what you read on a real book. As I wrote above you will benefit from the talking between the authors, but I must say that nothing beats the good old detailed books (especially the paper ones). So my advice is to select one of the many Erlang books out there, read it and complete the study chapter by chapter using these videos. Are the videos really so good? – Yes they are, both for content quality and video quality. I must admit that every time I see some content authored by Francesco Cesarini and Simon Thompson I feel at ease. My first Erlang Book ever was “Erlang Programming” and since then Francesco and Simon never let me down. I believe this is mostly related to their great experience in teaching and consulting: they know what to say, when to say it and how to say it. The quality of the videos is great too! The videos are 1280 × 720 and last on average ~15 minutes and this time amount is perfect because you never got bored or tired while watching them. I would like to point out that I read in some reviews people complaining about codec problems, but before writing this post I tried them in Ubuntu, Mac, Windows 7 and iPad and didn’t notice any kind of problem. That’s all folks! Now it’s up to you: are you going to buy these videos?? ?